I was coming back across town from a meeting on Friday. The weather was amazing – great blobs of rain coming down in localised patches across a bright wall of sun. It is often said, and I agree with this, that the best camera is the one you have on you. iPhones are great street cameras, the image quality is fine and they are small, fast and discreet. I’d have been worried about getting the DLSR out in these conditions. That’s a great photograph for an iPhone. I’m curious, do you have the 4 or the 4S? I still have the 4 and do wonder what the 8MP camera on the 4S is like. Thanks Mufidah. It’s an iphone 4. The cameras are surprisingly good. I’ve seen a few reviews comparing phone cameras and iphones score well, even against small point and shoots. More pixels don’t equate with better images if the sensor stays the same size. I think a good photographer can get a good photo from any camera. It is subject and composition than is the most important. You captured the light and the comp. perfect with the shadows and the man just perfectly angled. thank you Mimo. The small lone figure seems to be a recurring motif in my photos. Something deep in there I guess!? 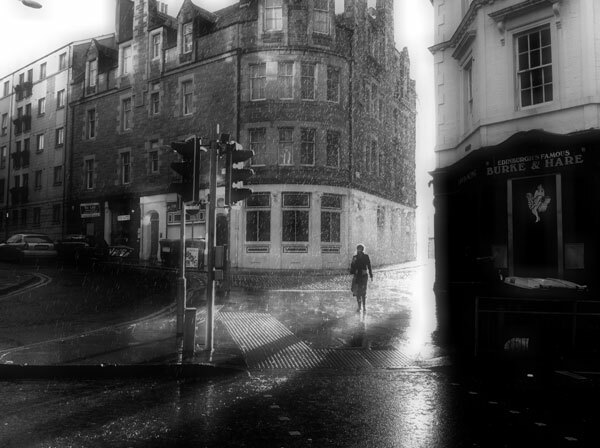 Beautiful street photography, the figure in back lighting, the long shadows and the rain. I love it! It’s quite timeless. Well done on an iPhone! thank you Robert. I was pleased with the image as well as having a camera on me. It is a great time to take pictures with the low sun creating long shadows across the city. I love to use my iPhone too. This image Karl is beautiful! The light is amazing and makes the whole thing quite intriguing.